NASA GISS being sued over FOIA failures | Watts Up With That? 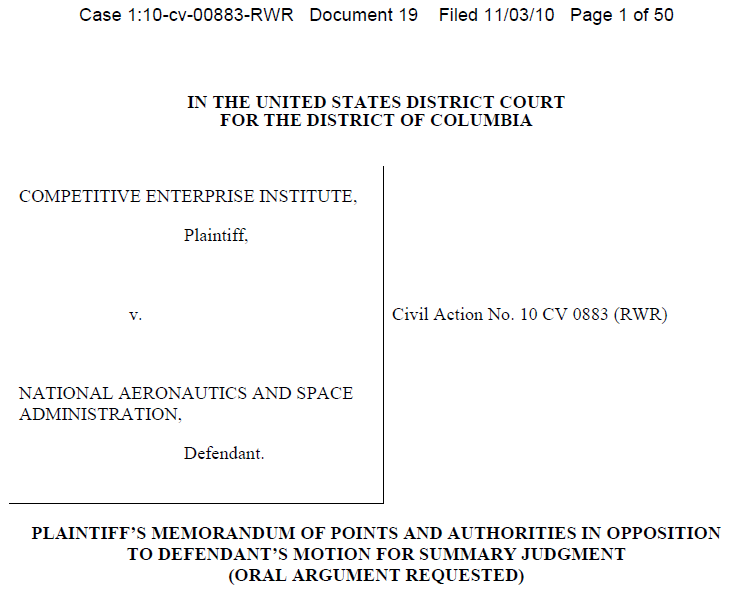 Last night the Competitive Enterprise Institute, through its outside counsel Gibson Dunn, filed its brief arguing against NASA’s rather scattershot and contradictory effort to dismiss our lawsuit requesting certain documents under the Freedom of Information Act (FOIA)(press release available here). Our suit, CEI vs. NASA (U.S. District Court for the District of Columbia), followed on the heels of ClimateGate, and a December 2009 Notice of Intent to Sue if NASA did not turn over certain records withheld since CEI sought them in August 2007 and January 2008 requests. That Notice was eleven months ago and, despite NASA offering some documents and admitting — temporarily — that certain others relating to the advocacy site used by NASA scientists, RealClimate.org were “agency records”, NASA then ceased its brief steps to comply with the transparency statute FOIA. Despite NASA stonewalling CEI has already learned, for example, that NASA does not, contrary to widespread media and pressure group claims, have an independent temperature data set. Instead, as NASA told USA Today in an email, despite its serial, breathless press releases trumpeting some new temperature high, it actually is just a modeling office, which also (for unknown reasons, possibly extra attention and importance, or mere advocacy) cobbles together some US data from the National Climatic Data Center (NCDC) with that of the Climatic Research Unit’s temperature history. You may recall how CRU withdrew its claim to a temperature history data set after ClimateGate led to an admission it actually lost its data. CEI also seeks emails from NASA scientists using Real Climate.org on official time using official resources, often to advance what NASA’s Goddard Institute for Space Studies (its climate activist office) has decided is appropriate public advocacy. Why did NASA delete timestamps off the [realclimate.org] website? After CEI filed the FOIA seeking RealClimate emails, administrators at Real Climate deleted all timestamps on all of their postings, making it impossible to show they were made during work hours. NASA admits that it discovered 3,500 emails on the computer used by Dr. Gavin Schmidt, a taxpayer-funded NASA researcher who spends working hours running and writing for RealClimate. But NASA refuses to produce the emails. Why did NASA delay? NASA did not ask Dr. Schmidt to look for responsive records until 22 months after we sent them the FOIA and threatened to sue. It is highly likely relevant emails were destroyed during this period. Furthermore, NASA took more than 900 days to produce documents pursuant to CEI’s two 2007 requests. The agency took more than 700 days to produce records in response to CEI’s 2008 request. NASA does not explain these delays. FOIA requires that an agency produce responsive records within 20 days. Although agencies rarely meet that deadline, even for “complex” FOIA requests, NASA’s average processing time is under 100 days. In 2008, NASA processed complex requests in 82 days, on average. In 2009, it processed such requests in 89 days, on average. CEI is represented by Andrew S. Tulumello of Gibson Dunn, which is handling the lawsuit pro bono. November 4, 2010 in FOI, NASA GISS, Politics. When you’ve tried to be a gentleman and point out mistakes to a group of people and they threatened blowing you up with a large red button, maybe its time to play by there rules and drag them to court where lying and fiddling of figures is not allowed. I wondering if a judge will be as defensive of billions of dollars of tax payer grants? CEI is leading the way again. Good job! Hold NASA accountable and don’t let up. It will be interesting to link the Mike Mann information and emails ensconced in the GISS information sets. This could be in furtherance of Cuccinelli’s lawsuit in VA.
As I have commented on several occasions, I believe the US legal system is the only way that the AGW nonsense will be brought to an end. I think many of the main protagonists on both sides of the pond, all those who have been funded by American taxpayers, will be less than comfortable under the cold eye of the Law with full disclosure of all research , data, codes, e-mails etc. Several other cases in the pipeline, I believe. Gavin should be made to refund his salary and pension contributions for all the time he was paid but not doing his real job. Freelancing at Real Climate can be be a hobby for Gavin but it is not what he was hired or paid to do. Gavin owes the taxpayers a refund. I am all for this although I reside in United Kingdom. I wonder about the timing. Could this be a consequence of the Republicans gaining a majority in The House of Representatives? I understand there will be hearings now into GISS and the other US publicly owned organisations. This could be part of an interesting pincer movement. Good military tactics. Surround them and destroy them. All I really want from them and their UK pals is honesty. I’ll bet he takes work home. And since RealClimate is a non-partisan site for communicating science to the public I don’t see how that is not part of his job. CEI is just tying block information for getting to the public. I think CEI’s tax exempt status should be challenged. It is flabbergasting, isn’t it? If you or I carried on like that we’d been in the clink quicker than you could say “I lost the data”. But I do fear that the people at the top of the legal establishment (judges and the like – especially the supreme and high court varieties) , just like our politicians (near the top), are not exactly free from influence. I am sure intense pressure is sometimes applied. I applaud these efforts, but if anything comes of this – if anybody ever gets prosecuted in the US or the UK over any of this – I will eat my kite. I still can’t get my head around the CRU getting off because of the six month limitation clause. What the heck is that all about? Presumably the Wayback Machine [and other internet archive sites] made snapshots of the RealClimate web site before the time stamps were deleted. Global Warmers at least should change this project for making profits by pouring the Empty into the Void for another less offensive to common sense, like straightly dedicating themselves to money counterfeiting, otherwise old fashioned reactions may arise that they may not gladly enjoy…..
IIRC , CEI initiated this lawsuit several months ago , possibly even last year . I think Chris Horner had a post about it here . Well, the hearings wont commence until sometime after January 3 or there abouts, I guess. It might be some time after that the hearings actually start. You have tried a lot of things: Ponzi schemes, credit cards, hedge funds, collaterals, etc.. for avoiding working, however this thing of selling the air…or rather “CO2 permits” was an exaggeration: You will surely ruin the world!, you will kill the Golden Eggs’ producing Chicken. Ok buddies…it’s time to stop it! RealClimate is non partisan? Web browsing is part of his job at NASA? CEI is trying to block information from going public with a lawsuit over FOI compliance? Right – a pincer movement to squeeze out the truth – yes! “Honesty is the first chapter in the book of wisdom.” – that’s when Presidents and law givers were full of wisdom, I guess. Intresting times indeed , and removing time stamps , did they really think people were to stupid to work why and to actual keep a copy of these pages before this happend? Well perhaps , they do seem to capable of amazing levels of arrogance , complete with a total lack of introspective. Those guys should wait until the Republicans take back the control of the house before… oh, wait… they just got the control back. Go for the throat guys. Yep, you can run, but you can’t hide! Realclimate posts with date/time stamp all the way back to 2004…YES! Action on these matters gains importance with the announcement by President Obama that he don’t need no steenkin’ Congress to enact ‘climate-saving’ legislation, threatening instead to employ executive orders to the Environmental Protection Agency to get on with the task of saving the world from the Gas of Life. His threatened actions are reinforced by his increasingly frequent references to ‘ignorance of science’ on the part of the public and the Congress. It’s disturbing and sad that US government agencies have to be taken to court to force them to comply with the law let alone get them to just do the right thing. I agree with Dr TG Watkins; the cleansing power of legal action and court time under oath may be the best way to go, now. And Mike, you have a strange definition of non-partisan; Realclimate is very clearly extremely partisan and Gavin has little patience with those who disagree with his version of the gospel according to the church of Climatology. If you keep an open mind and remain civil to us climate aetheists/agnostics/Sooners here at WUWT, I am sure that you will still be welcome here! So much for the idea that Progressives are good scientists. It took a stern rebuke by thinking/voting Americans to get this whole investigative process going again–with tort reform completely off the table under Obama (a simply reflection of the Trial Lawyers Union conveniently called the “Democratic Party”) and much of the “Stim-you-less” not scheduled to be spent until (again, conveniently) the presidential election in 2012, there was no chance of disinfecting those in power without the light of day. Mike, thanks for two things! First, thanks for the chuckle, I needed on today. Secondly, thanks for the re-affirmation that alarmists wouldn’t know reality if it was on the monitor right in front of them. Interesting CEI is represented by Gibson Dunn. For those who aren’t aware, Gibson is an old, prestigious law firm, with formidable capabilities. It would be great if Gibson is doing this pro bono — if not, it will be a very expensive undertaking. In any event, having Gibson involved would certainly add some gravitas in the corporate context, and would cause any defendent to take things seriously. I can’t comment on whether NASA/GISS gives a hoot; I get the sense that when you’re playing with someone else’s money (taxpayers’ money, that is), there tends to be a bit less concern. One outrage after another. These alarmists seem to think they can do and control anything they want. Well we have a house of representatives now that might have the fortitude to investigate! I’d say essentially impossible if there’s no way to confirm what they’re telling you is the truth. Here’s a link to CEI’s web page accepting contributions. I’m throwing them a few bucks. I said a couple of years ago someone ought to be archiving realclimate before the more embarassing posts started disappearing. Someone responded that they were already doing it. Might have been Rick Werme? Things are vastly worse in medicine than in AGW…. It will be very interesting to cross compare the emails with the CRU archive. Might give some idea of the extent to which both are incomplete. Er, say again? The models predict tropical tropospheric warming and it hasn’t happened. What else have you conveniently misstated or ignored? I’ve always thought climate science should be subject to proper peer review! … Peer review is not their cronies on (sur)realclimate.con but my peers in a jury! Fred, don’t be so sure that that is not exactly what he was paid to do. Maybe not by the taxpayers, but maybe with the approval and encouragement of certain supervisors. Realclimate was and is a way to get out propaganda in a way that was supposed to preserve the credibility of the institutions, if done properly. If any management condoned it as part of their marketing campaign, I don’t think HE would have to refund his pay. Chris Horner, CEI and Andrew S. Tulumello of Gibson Dunn (who is doing this pro bono) are major heroes for taking this battle to the Courts. I salute them and await further developments. It appears it was rather cloudy during Sunshine Week. It also looks like Michael Mann is pushing back in the face of Cuccinelli’s 2nd law suit. Let’s hope the CEI manages to nail Gavin’s feet to the floor. One suspects that he has been a political activist during his working hours (funded by taxpayers). That has to be an indictable offense. Why else would GISS have deleted all those time stamps? To have deleted the time stamps is far worse than to have left them. As deleting them suggests that the people involved knew that what they were doing, running an advocacy site on NASA [ie., taxpayer] time and money, was wrong and then amateurishly tried to cover their tracks. The word amateur seems to figure prominently with the CRU/GISS crew. The golden rule of the internet: if you post anything, assume that there will be a record somewhere and that it will be found and brought to light by someone. I posted comments about this before the day of climate gate. I knew gavin was on the clock and he was blogging during the day. The next point is a trap. I also mentioned this trap. it is stupid funny he (gavin) has time to blog and censure posts but has no time to compile responses to FOI requests. Same with Hansen. He was time to stalk coal mines but can sit in a chair and ask a tech to respond to FOI requests. It is just harrassment!!! Mike, are you serious? You are an advocate for the advocates. OT – documentary now on uk channel4 about what the green movement got wrong. Still toes the line that climate change is happening and is massive. Interesting idea though that it is the work of the greens opposing nuclear power has contributed to more coal being burned. So if climate change is down to co2 its their fault! “In the absence of any credible alternative theory to” the fallacy of argumentum ad ignorantiam? Instead of a civil case it should be a case of treason against its country, as the purpose of this climate change scam it is, as Lord Monckton said, Global Governance, and this means helping a foreign organization (the UN) to achieve its goal of governing upon one’s own homeland, and that can’t be called by any other names but treason. As for real climate, it is so obviously run with the blessing of giss, it is part of the machine. Personally I think they are toast, which is of course ironic as that’s what they gleefully discuss happening to all of us..
On March 15, May 11, July 15, Aug 28, and Nov 16 2009 NASA launched the Space Shuttle. On Feb 8, April 5, and May 14, 2010, NASA launched the Space Shuttle. …But within those 2 years they couldn’t mail some papers. They’ll launch Discovery tomorrow at 3pm. I’m encouraged by this lawsuit. But lawsuits can take a long time if defendants use delaying tactics. But a Republican Congress has subpoena power and can act quickly, with just a House vote, or even with the vote of a subcommittee. Let Mr. Gavin Schmidt argue that Congress can’t be permitted to see his taxpayer-funded emails, and can’t be allowed to review the time stamps on the (Michael Mann owned) Real Climate blog that he has run for years during GISS working hours. Anyone, such as the CRU/GISS crew, who might think that hitting the delete key permanently deletes anything should not be allowed near a computer and certainly not onto the internet. Deleted material can be recovered by forensics and the action of deletion suggests a willful intent to hide. A congressional request is better than a judge. Screw with congress and you get defunded. Comments are even better than the post. Lots of clever b…… here! It is so sad. NASA used to stand for crazy intelligent. Now it just stand for crazy. What the hell happened? They used to be run by your average conservative “dumb” beaurcrats but at least them “dumb” ones new the import of intelligence however crazy it was. Undoubtedly the action of those with nothing to hide, right? Will NASA set up an ‘independent’ inquiry next? Hats off to CEI! It’s a good path taken by CEI, to take legal actions on misallocation of (US) public funds for political science in climate, while other groups take on the non-science aspect of AGW belief. 2010-2011 could be the coffin on the nail of the AGW religion. It is very difficult to construct a coherent theory that accounts for the internal dynamics of recent warming in the absence of elevated GHGs. “Recent warming” has not occurred, unless you are roughly talking about the period including Earth’s emergence from the Little Ice Age and ignoring the past 10-15 yrs. of no GW, something which none of the ipcc Model scenarios predicted. Nor has a tropical trophospheric “hot spot” developed, which the Climate Scientists are now saying is a nonspecific result of GW from any cause. Hence, there is no “recent warming” according to ipcc Climate Science itself. The something in the air in America. What was able to be swept away before is now going to be brought into the light. Let the public see and know what has been going on at GISS. The fingers of a corrupt Washington has been thriving there. But now we the people have gotten up from the sleep. And I feel this is only a start. Washington will continue to be changed. I don’t see an end in sight. Funny how they think it is the skeptics who are holding up the scientific process. Gavin’s justification for all the deletion of serious questions on RC. One could call it gissinformation. Makes it hard to identify times on RealClimate’s servers. But they keep forgetting all the places they post stuff. ‘…I wonder how useful the source country section is? It is not a criteria I have ever used to look for material, but maybe others do. The more you try to hide, the deeper you have to dig. BTW, snagged a copy, in case they edit it, too. But this post will show the time and date that the information was there. Gavin and Mann refuse to turn over incriminating information. If they turn over only part, they will prove they have tried to destroy records. The trouble with lies and deceit is that they usually catch up with you in the end !! The bigger the web (pardon the pun) of lies, the greater the chance the deception will ultimately fail. It doesn’t matter if it takes 10 minutes or 10 years – the truth will come out, and as seems clear to anybody from the ‘outside’, only a handful are really responsible for all this disinformation and deliberate public misleading (or fraud if you prefer). I will never be an apologist for GISS, Hansen, Schmidt, or the rest of that crew; nevertheless, I have first hand experience producing emails that are more than a year old. It is a huge pain in the derrier. In some cases, they are gone because the records retention policy does not require emails that are not “records” to be retained. At EPA we dump these every 90 days. Worse, most federal employees have no discipline regarding the record retention policies. Thus, the FOIA guys at GISS/NASA are in deep and are going to get creamed, either from a judge or Congress, and probably both. It’s never the deed that gets you in trouble, it’s the cover up. All you have to do is say “Yeah, I messed up, my bad” and generally all will be forgiven. A prefect storm could be coming. To RockyRoad, DCC, Gene Zeien, Nullius in Verba, JPeden. I am happy to discuss the pros and cons of CO2 induced warming (as I understand it) on any science dominated thread. Unfortunately this thread highlights the recent trend of using of the legal framework to harass scientists. I see this as a tremendous wrong. If their methods are deficient or conclusions ill-conceived, show them as such in the science journals. Ammonite, you cannot explain earlier warming and cooling periods with CO2, so why do you think now is any different? The fact is that once you got a convenient story that fed a lot of special interests, you stopped looking, didn’t you? Relative warming of night over day, polar over equatorial, winter over summer, low atmosphere over high atmosphere are all markers of green house gas. The night over day part is a signature of UHI. I believe the others have been dealt with here in the past. Even before being cold enough for salt usage, there’s the effect of water usage in populated areas. This is particularly noticeable in very dry climates – for example Las Vegas. Phoenix too I believe, and so on. Anywhere there are significant population ‘islands’ there is all the vegetation being watered that normally wouldn’t exist (this more the case in drier climates of course), regularly watered lawns, flower beds, trees, pools, created reservoirs, ponds, and lakes, recreational facilities or displays, water fountains…. The strip in Las Vegas is notably more humid than even a few miles further out in the very tightly packed suburbs, and they are notably more humid than a bit further out in the desert. Both winter and summer. Also, iirc, temperatures in the Antarctic have dropped, not risen. Thanks for the update re CEI’s lawsuit . I should have been a little more on top of the situation , but sometimes it gets hard to stay abreast of everything . If it weren’t for Chris Horner , I’d never had found WUWT . BTW , loved ” it’s deja CRU all over again “. Thank you USA, for having the courage to fight back, by voting to excise Post-normal sleaze, spin and stupidity from what western politicians have been taking for granted for far too long! OK, it’s just the first steps in cauterising the cancer that threatens us, but it’s a step in the right direction. Questions that were, until recently, unutterable are now bubbling to the surface. The strange warmist alliance that encompasses opportunistic capitalists, hippy stoners, sloppy scientists, rent-seeking politicos, gullible journalists and, a myriad of, useful dupes can no longer duck the debate. Consensus is a wonderful weapon but it is double edged. Early gains crumble when confronted by accurate revelations! You dump every 90 days? I worked for DOD up until about three years ago and they kept e-mails forever. Not on the main system, but they WERE available if needed on some sort of back-up system. And our system administrator couldn’t get to them (assuming he wanted to) to change them. We had to do that because we were required to keep all documention (forever it seems) incase of legal action or Congressional inquiry. Paper stuff for all Governmental departments is stored in an old salt mine somewhere. Again, forever. I don’t quite understand why the CEI allowed NASA to have such a huge delay. If FOIA requests are meant to take 20 days , I can understand the CEI waiting say 50-100 days but 700 days seems extraordinary ( they certainly cannot be accused of hassling NASA). Surely there must something within the law that gives the CEI a means to object or get more urgent action. Robert, Roger & Rational. The merits of your case or the deficiencies in my climate knowledge (of which their are many) are surely a matter for discussion in an appropriate forum. Amongst scientists that would be through the established journal process, not the law courts. I will have no problem if road salt proves a better explanation for climate behaviour than CO2. I will have a huge problem if the proponent of such an idea is the target of political or legal attack. Freedom of expression without interference is one of the cornerstones of modern democracies. Consider very carefully the consequences of weakening it. It is very difficult to construct a coherent theory that accounts for the internal dynamics of recent warming in the absence of elevated GHGs…. Well, that seems to imply to me that our current theories of how the climate system works are simply inadequate. Why? How do you account for the fact that each of the last 4 major interglacial periods were warmer than today, some of them with sea levels considerably higher than the present, while CO2 levels were lower than today? Magic? 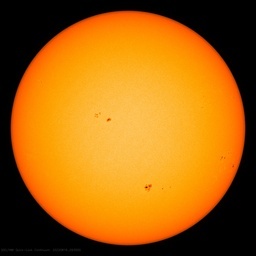 This is going to be the end of AGW but it is not just NASA but also the MSM that needs reminding of its obligation to search out and print the truth. We have had the reminder of what they used to be like by the tag on “gate”. Where are those investigating journalists when you need them? I will have a huge problem if the proponent of such an idea is the target of political or legal attack. Freedom of expression without interference is one of the cornerstones of modern democracies. Freedom of speech has never included the freedom to use the speech in the commission of crimes such as bank robberies, mass murders, medical fraud, or falsifying data for grant fraud. It is remarkable to see you have expressed no equivalent objections to the use of legal process in denying free speech to those persons reporting or whistleblowing evidence of AGW related scientific fraud. “Using of the legal framework to harass scientists”? Scientists? What scientists? Do you mean the skeptical scientists fired from their jobs as state climatologists, the EPA, and elsewhare for challenging the AGW fraud? No? Oh, yes, you mean the fraudsters implicated in the Climategate e-mails. They’re not really scientists, now are they, otherwise they would have been immediately forthcoming with the scientifice evidence that would have made a 700 day old FOIA request and enforcing lawsuit entirely unnecessary. To be a real climate scientist you would have to practice a real scientific method with real data and scientific method replication by sceptical critics, now wouldnt you? Or, perhaps you would disagree because you believe in post-normal science and the quality of the results of post-normal science? You say if the fraudsters “methods are deficient or conclusions ill-conceived, show them as such in the science.” Perhaps you have some magical method for doing so despite the refusal of the fraudsters to disclose the scientific data and methods required to do so by any person seeking to replicate the scientific experiment. Freedom of expression does not include shouting ‘fire’ in a crowded theater when there is no fire; neither does it include shouting ‘we have set ourselves on fire’ on a crowded planet when we have in fact not. The objective of the investigation, in both cases, is to determine if the person or persons doing the shouting can prove that they had the evidence at the time to cause the panic. Freedom of expression does not include the freedom to lie and cause a panic. How do you account for …? Magic? Hi Mike. You have elected to challenge my statement on an evidence basis, something I respect immensely and not a lawyer in sight. Fraud must be the most overused word on this site. Have independent groups attempted to reconstruct past temperatures from paleo data? Were the results broadly consistent with MBH99? Did the results change appreciably without tree ring data? Is this a complex and ongoing area of research? Could a researcher have other motives (noble or otherwise) for not releasing data than to hide wrong doing? No doubt we have arrived at different conclusions. Will you be applying your investigation to every scientist and scientific body attached to the IPCC? The danger I percieve Andrew is that any scientist anywhere has work that could “cause a panic” and on the basis of a hearsay email I can launch a comprehensive investigation into any and all aspects of their work (effectively preventing ongoing research for a period) which may be motivated by political ends. Such a process is open to significant abuse. I expect to be offline for some days. I realise I am swimming against a significant current at WUWT on this issue. Please take care with ends and means. I made a start! How about we choose a month or so each? Note any posts by NASA employees on Mon to Fri between 9am and 5pm. By the slowness of web.archive I guess lots of people are looking! Please take care with ends and means. Ah, if only the Warmalarmist “Scientists” had heeded that advice, we wouldn’t be in this mess to begin with. But, it’s too late now. Let the chips fall where they may. I suspect even they know what they are guilty of. Precisely my reaction to this thread, which is an exercise in masturbation by the anti AGW crowd which dominates this web site. The larger problem is Gavin and Mann offering bad science which will be obvious if the do produce the e-mails. It will incriminate them as biased, looney and horrible in science. The largest problem which many suspect is cooking data. If data has been manipulated, temps adjusted downward or upward to fit the dogma we have a global problem. If the IPCC relied on data and reporrts regarding data that was cooked and altered, we have a political volcanoe. What you say is very true, however there is no freedom to lie and cheat and deceive and nor should there be. Bodies and organisations that are funded by the taxpayer should be held accountable for their individual and corporate actions. Freedom of expression should never be conflated or deliberately confused with fraudulent activities and that is what the warmists are attempting to do. The FOI success on this so far reveals that the “independent” reconstructions of GISS and Hadley are only different in how they manipulate the data, if then. Phil Jones et al at the University of East Anglia (UEA) Climate Research Unit (CRU) and a number of their associates committed violations of the law regarding Freedom of Information (FOI) and thereby defrauded membrs of the public entitled to certain scientific information while colluding to destroy the taxpayer paid scientific information. They also manipulated the laws regarding the statute of limitations to commit the violations and still escape prosecution and punishment for the fraud and other violations of the law. Likewise, the recipients of the FOIA requests at NASA GISS have blatantly violated the laws and defrauded the public by their withholding of taxpayer funded information for more than tentimes the allowed delays and suspected destruction of evidence. Consequently, there is abundant evidence of fraud by the subjects in question. It only remains to be seen to what extent, if any, the apparent defrauding may be the legitimate subject of further investigation and potential prosecution. In the meantime, don’t pretend the targets of these investigations have commited no fraud. The Climategate disclosures are already acknowledged by the British Government as undeniable evidence of FOIA fraud at the absolute minimum. Likewise, NASA has already acknowledged that it is in violation of the FOIA law at the very least. It is unfortunate for you that “fraudsters” and “fraud” are terms justifiably applicable to the actions of the AGW proponents you wish to defend, so you had better buckle on your seat belt and get used to the terminology. You’ll be seeing much more use of the terms and worse in the days, weeks, and months to come as the activities of the AGW proponents begin to come under investigation in connection with Cap and Trade, EPA regulation of carbon dioxide, grant fraud, and so much more. As Bill Clinton discovered to his chagrin, sometimes there are still consequences which result from trying to litigate the meaning of what is is in an attempt to deceive the public. Precisely my reaction to this thread, which is an exercise in [trimmed] by the anti AGW crowd which dominates this web site. The explanation is quite simple. You are erroneously and unjustifiably projecting your own behavior in the mistaken belief others behave as you do. If you want a discussion of science then demand immediate compliance with the FOIA requests so the data, methods, and other information encompassed by the FOIA requests can be replicated and discussed. Don’t, and be ignored as a troll attempting to assist others to evade scientific, political, and legal accountability. So, you oppose any invstigation because you believe “every scientist and scientific body attached to the IPCC” has “work” and/or e-mail evidencing such violations of the law as fraudulent denials of FOIA requests and fraudulent falsification and/or misleading data and methods used to commit grant fraud? I think this whole issue could be resolved if the Goddard Space Flight Center would simple absorb the work current provided by GISS in their expen$ive New York City office, and move those who want to continue down to their headquarters in Greenbelt MD. They may have more oversight down there. They should also consider changing their management structure. Of course, an even better solution would be to make GISS a non-profit, non-governmental entity funded entirely by George Soros. It would save my tax dollars being spent on dubious GISS projects and software, and Hansen and company could make as many hysterical climate “disruption” press releases as they want, backed by their ideological soulmate, George Soros. Everybody wins! As a denier, I couldn’t agree more. The GHG is called water and the reason it increased ~1975-~2000 is called positive PDO. Explains everything. No proof needed, just like CO2. There’s one of the most obvious slow-witted example of circular AGW logic I’ve evvaarr seen. It should be quote of the week. So how are other scientists to expose shoddy science in juornals when they can’t get the original data and methodology? OMG, that’s precisely why they file a FOIA. No one is talking about deficient methods or ill-conceived conclusions as a basis for prosecution. I understand that this is about failure to comply with FOIA laws, covering up data, possible destruction of materials related to the FOIA requests, among other things. (Please correct me if I’m wrong.) Then there are civil issues (as outlined above). How is it that scientists are immune from investigation and possible legal prosecution for alleged bad acts when there is sufficient evidence to warrant an investigation? If you can’t investigate via legal channels, what chance is there to build a case and prosecute? When did this happen? Gee, I wish *I* had the foresight to become a member of the privileged elite. Amongst scientists that would be through the established journal process, not the law courts…… I will have a huge problem if the proponent of such an idea is the target of political or legal attack. Freedom of expression without interference is one of the cornerstones of modern democracies. Consider very carefully the consequences of weakening it. Ammonite, courts are appropriate and unfortunately sometimes necessary when it comes to issues such as violating FOIA requests, misusing taxpayer dollars e.g., government grants, or using government property inappropriately or for non-government purposes, or conducting personal business (this includes advocacy and posting to websites, unless one’s job description specifically includes public outreach – and one’s ‘outreach’ is proper also), and even scientific misconduct of all sorts including fraud when it is financed by tax dollars, and so on. Ideally it wouldn’t ever get to this point, but we don’t live in an ideal world. This has nothing to do with freedom of expression, and everything to do with professional ethics, proper use of tax dollars, and following our existing laws. Considering the billions if not trillions of tax dollars being spent in these areas, frankly I think there’s been far too little oversight, and that its long overdue for some of these things to be prosecuted in our courts. CEI needs to engage the services of a good hacker. Those stampless emails left tracks in ISPs etc. It is VERY hard to actually purge your e-tracks, as many have discovered to their embarrassment and dismay. Further to your point to Ammonite, ‘freedom of expression’ is actually a protected right to criticize the government. Period. It is widely misunderstood and abused as a claim for protecting illegal or mendacious communications to others or misleading the public. Thanks Brian, you’re absolutely right, and its certainly a key point in this discussion. I hate the idea of scientists being sued like this – but I hate even more when a few rotten apples, scientists who behave as anything but scientists, make it absolutely essential that they ARE sued. Too much spin. I can feel the vibration through the soles of my feet. If there is spin I assume it’s full of lies until I have fact checked everything.